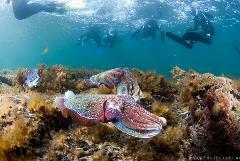 Jump in and swim with giant Australian cuttlefish as part of a group community tour with maximum of 24 participants. Join nationally accredited snorkel instructors for a guided snorkel at Stony Point in the Upper Spencer Gulf Marine Park. 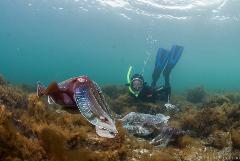 Private snorkel tour of the giant cuttlefish aggregation (up to 4 people). Join your PADI Pro guide for a snorkel at Stony Point in the Upper Spencer Gulf Marine Park followed by hot drink, snack and cuttlefish 360 Video VR experience.